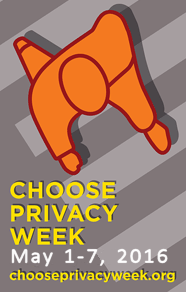 Is your library preparing to observe Choose Privacy Week 2016? Join the ALA’s IFC Privacy Subcommittee and the Office for Intellectual Freedom for a free webinar that will offer solid guidance on developing privacy programming that will educate and engage your library users and provide an update on current privacy issues confronting libraries today. The webinar will also offer brief introductions to resources on students’ and minors’ privacy and a guide to free and low-cost print and online resources that can support your library’s observance of Choose Privacy Week. Choose Privacy Week is the American Library Association's annual, week-long event that promotes the importance of individual privacy rights and celebrates libraries and librarains' unique role in protecting privacy in the library and in society as a whole. Erin Berman of the San Jose Public Library will discuss the process of transforming a broad, intimidating topic like online privacy into a learning opportunity that is personal, approachable, actionable, and reusable. Learn about SJPL’s Virtual Privacy Lab, and how this free online resource can help you and your patrons build personalized toolkits for optimizing online privacy. Michael Zimmer, Ph.D. of the University of Wisconsin – Milwaukee will discuss how to use films, and documentaries on privacy and surveillance to increase awareness among patrons and spark conversations on controversial technologies and practices. He’ll also provide ideas on finding guest speakers in your community to help guide discussions for your patrons. Jamie LaRue, the new Director of the Office for Intellectual Freedom, will discuss his perspective on privacy and libraries and provide a scan of the most pressing privacy issues confronting libraries today.